NEW! 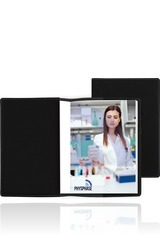 Flexible, soft cover refillable journal with built in elastic closure. Pen loop. Business card slot. Domestic-made refillable journal inside features white flexible paper covers, 100 sheets of ruled filler and perfect-bound spine.